The Sony A7000, Sony's upcoming Alpha camera is imminent. Its launch has been mooted for CES 2019, which is in the middle of January so all should be revealed then. Until that happens, though, here's all the Sony A7000 rumors we know about so far, in one handy place. 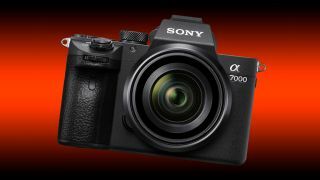 UPDATE: Speculative specs of the Sony A7000 have been revealed, with the camera set to get a brand-new 32MP sensor and increased ISO. We've added the new details below and are hoping to get hands on with the device at CES 2019. Our speculation about this possible new Sony APS-C camera is prompted by stories emerging from sonyalpharumors.com, and we’ve combined these with our own thoughts and observations about Sony’s APS-C camera range. It is, after all, long overdue for attention and consists of just two designs, both arguably past their sell-by date. We can probably forget about the old 20-megapixel Sony A5100 launched way back at the start of 2014 and now only sold as a cut-price entry-level bargain. In reality, it’s the A6000 series which is keeping Sony’s APS-C range alive. The ageing A6000, also launched in 2014, is a decent enough low-cost/high power enthusiast camera, the A6300 arrived in 2016 with better autofocus and 4K video, while the A6500 followed later that year with in-body stabilization and a big buffer for extended continuous shooting. All three cameras are still on sale. The A6000 is a bargain, the A6500 is the most advanced version and the A6300 occupies a kind of stopgap status in the middle. All three use the same rectangular rangefinder-style body, which feels increasingly at odds with the kind of lenses Sony its now developing and the high-speed video/action capabilities it’s concentrating on. Will it be called the Sony A7000? We’re speculating this would be the name for any new Sony APS-C mirrorless camera even though there is no hard evidence yet to indicate this will be the case. But it does seem logical. This name would be an extension of the naming system used for previous Sony APS-C mirrorless models and a step up from the existing A6000 range. Triple-digit naming seems unlikely since this would conflict with Sony’s older full-frame SLT models like the A900, and the same argument goes against a double-digit naming system, as used for the company’s APS-C SLT cameras (like the A65, A77 and so on). What will the Sony A7000 specs be? According to Sony Rumors, the below specs are what we should expect from the Sony A7000. This is according to a post on Chinese social network Wiebo. According to sonyalpharumors.com, the new camera will by styled more like the full-frame A7 and A9 models, with an electronic viewfinder mounted on the top of the camera in line with the optical axis of the lens. It will also have ‘improved ergonomics’. This all points towards a camera similar to the Fujifilm X-T3, for example, which would probably be more attractive to DSLR converts and enthusiasts, and better able to handle larger lenses. There's not much wrong with the 24-megapixel APS-C CMOS sensor already in the A6500, so we may not see big changes here.... though Sony may still surprise us. APS-C camera resolution seems to have peaked for now at 24 megapixels and there seems no reason for Sony to push this further at the possible expense of image quality and processing speed. The Fujifilm X-T3 has 26 million pixels, but that’s not a big difference, and the only APS-C camera to offer more was the ill-fated 28-megapixel Samsung NX1. We're expecting the new Sony to have a top-mounted EVF like the Sony A9, and it would be great if it shared the same 3,686k resolution. The current A6500 has a 2,359k EVF, which is pretty average by today’s standards, so it would be great to see the 3,686k EVF used on the Sony A9 or at least some increase in resolution. We do hear that the EVF will offer blackout-free viewing in continuous shooting mode. We’ve yet to see a fully-articulating rear screen on the back of an interchangeable-lens Sony Alpha – so far they’ve simply had tilting mechanisms – so could the new APS-C model be the first to offer this feature? This is one area where cameras have made massive strides, and the current A6500’s 11fps maximum frame rate (8fps with live view) now looks pretty tame. The new Sony model is believed to offer 20fps, which we assume to be using an electronic shutter (there are no mechanical shutters in this market that can achieve this speed). If so, that would be a big step forward, though the Fujifilm X-T3 can hit 30fps in its 1.25x crop mode and the Olympus OM-D E-M1 II and Panasonic G9 can reach 60fps (with focus locked on the first frame). Alongside the in-body image stabilization, this was the big breakthrough for the A6500. It’s little use having high continuous shooting speeds if you can’t keep them up for more than a couple of seconds, and we would expect to see the A6500’s 301 JPEG/107 RAW buffer capacity carried through to the new model – though maintaining that capacity at higher frame rates could pose a challenge. Sony has been making some great full-frame lenses but very little for APS-C. There's no constant aperture f/2.8 standard zoom, for example, and this Zeiss 16-70mm f/4 is about the nearest thing. We also hear that there are some new APS-C E-mount lenses coming, and if that’s true it’s not a moment too soon. For a while now the existing Sony A6500 has been riding the wave of Sony’s full frame lens announcements. It’s an effective camera for sports, where a full-frame lens is no disadvantage, but there’s been a real lens development vacuum with Sony APS-C lenses. Sony lists just 17 APS-C lenses on its website, and most of these are low-cost consumer lenses. Any new APS-C model would need a premium f/2.8 constant-aperture standard zoom at the very least, and right now there isn’t one. Sony has already developed in-body stabilization for its existing A6500, so this seems inevitable in any new camera. This seems a no-brainer. Sony already uses this across its range of full-frame mirrorless cameras and successfully implemented it in the APS-C A6500 way back in 2016. It would also give any new Sony camera an advantage over the Fujifilm X-T3 (though not the Fujifilm X-H1). Sony's APS-C range has been languishing for a while now, and it's now got to compete with cameras like the Fujifilm X-H1. The message we keep hearing from mirrorless camera makers is that the market is strongest in the enthusiast/pro sector, and it seems likely that any new Sony APS-C mirrorless camera will be to be pitched at this level. Our top. Tip? Take a look at the Fujifilm X-H1 and X-T3 and imagine a Sony camera just like these. Photokina 2018 has come and gone without any announcement from Sony, but the Photo Plus Expo in New York from October 25-27 is another popular time for camera launches. The rumors are than an announcement is imminent, though while this story does now have some serious momentum the lack of any hard facts suggests we might have to wait a little longer. There’s a pretty small window of opportunity for Sony between the current A6500 and the full-frame A7 III, and it will also have a close eye on its APS-C rivals. If it does launch a new A7000 to compete at the top end off the APS-C mirrorless market, we’d expect a price in the region of $1,600/£1,600 to $1,800/£1,800. CES 2019: all the camera news, from the huge technology show.